Manchester Thunder’s Caroline O’Hanlon has been named Vitality Player of the Month for March. The dynamic centre has been a key figure in Thunder’s climb to the top of the Vitality Netball Superleague table over the last month. 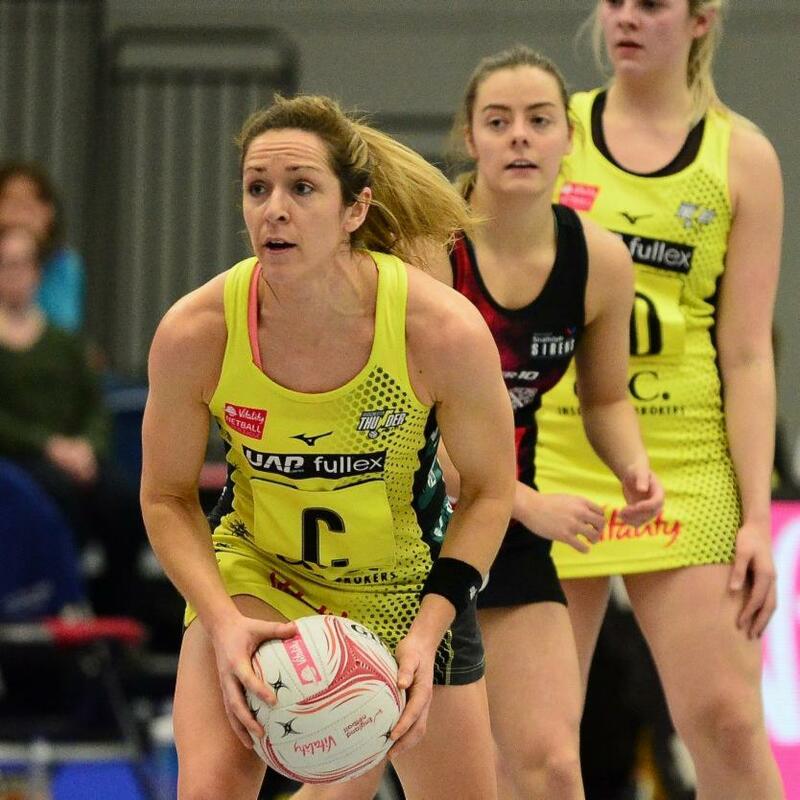 O’Hanlon, who signed for the Black and Yellows in 2017 ahead of the 2018 season, featured in every game in Thunder’s impressive run, which included their one-goal win over title rivals and defending champions Wasps Netball. She has delivered consistent performances and been a machine in the middle with her range of passing, experience, energy and passion helping her teammates to flourish and show formidable form. Manchester Thunder head coach Karen Greig was full of praise for O’Hanlon and said: “March was a really tough, busy month for us, having 4 games in 13 days it was tough for our squad to back up performances. Upon finding out that she’d received the award, Caroline said: “Thanks very much!! I’m surprised and honoured to receive this award. “It reflects how well our team are doing to be acknowledged like this. I’m surrounded by great players at Manchester Thunder and just enjoying being part of this ambitious group. Away from netball, O’Hanlon also plays Gaelic football for Armagh Ladies. You can find out more about how O’Hanlon balances dual-sport demands and plays both at the highest level in this video recently featured on BBC Sport. The Northern Ireland captain will be leading her country into the World Cup in July under the guidance of Thunder assistant coach Dan Ryan who is also Northern Ireland head coach. She has competed at two previous World Cups (2003 in Kingston and 2011 in Singapore) and will be looking to help her country to their best-ever finish (7th in 1983). If you can’t wait for the World Cup to see some of your favourite international stars in action, join us for the BIG Easter Weekend and experience two days of breathtaking netball as world-class athletes take to the court to represent their Vitality Netball Superleague sides. You can get your tickets for the BIG Easter Weekend here. Caroline O’Hanlon has signed a contract at Manchester Thunder for a second season. The Northern Ireland captain will stay in the Back and Yellow dress for the 2019 campaign. She is the third signing to be announced by Thunder, following the return of Laura Malcolm and Ellie Cardwell from Severn Stars. Centre O’Hanlon, 34, was the real engine room of Thunder’s centre court last season and was a key player in seeing the club reach the play-offs. O’Hanlon said: “I’m really delighted to sign for Thunder again this season. “Last season didn’t quite last as long as we would have liked, so I’m hoping we can go all the way this year and I can’t wait to get going. Thunder are set to announce the rest of their 2019 Superleague squad over the coming weeks, ahead of the Fast5 tournament in October. Manchester Thunder managing director Debbie Hallas said: “Having someone with Caroline’s experience back on board for the 2019 season is very important.